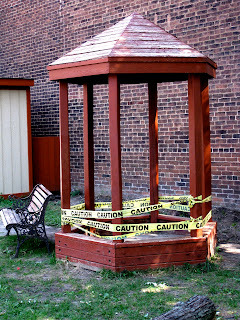 We lost a lot of good people to gazebos this year. I've seen crazy things in my years as a cop, but nothing quite like this. Girl's name is Mandy. Boyfriend's name's Rick. The two of 'em have just been out to the show. Saw that movie Paranormal Activity, of all things. Witnesses can place Mandy and Rick at the theater. After the show, they take a little walk over to Briar Hill. Lotta kids go that way to do a little messing around. Nothing any of us haven't tried in our day. One moment they're doing their best shimmy and the next, they're just gone. I know what you're going to say. It sounds impossible. And it's true, our key witness is a vagrant who was on his own personal booze cruise in the park. But he swears up and down to what he saw. And I believe him, because here's the thing: there's been other victims just like these ones, in other parks. I'm praying that soon this case will break. In the meantime, keep your loved ones away from gazebos.